SUPERIOR PENETRATING, WATER-REPELLENT TREATMENT FORMULATED ESPECIALLY FOR PRESSURE-TREATED TIMBERS, DECKS, DOCKS AND PILINGS. Specially designed for pressure-treated lumber, WOODguard® SWO is our clear and colorless protectant designed to help prevent warping, cupping, splitting and nail popping in wood. 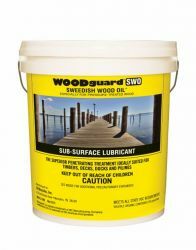 Acting as a sub-surface lubricant, WOODguard SWO is actually absorbed into wood and bonds with its cell structure. While effectively repelling water, the product’s oils work to lubricate and stabilize the wood. Recommended for use on pressure-treated wood decks, docks, pilings, fences, storage buildings and all other pressure-treated wood. Clear and colorless to highlight the wood’s natural grain. Dries into the wood and will never crack or peel. Helps retard warping, cupping, splitting and nail popping. Restores wood lubricity typically lost during wood pressure treatment. Meets VOC standards in all 50 states. Learn more about VOC emissionsHERE.